Arkham is a beacon, calling out to those who feel an unknowable truth in their heart. For these heroes, there is a duty to defend our world from ancient evils. Through skill, intellect, the mystic arts, or pure determination, these investigators are a small flame of light in a city of encroaching darkness. Picking an investigator at the start of your games is an important choice, as it will help define your role in the upcoming investigation. More than that, a customizable starting kit lets you further tailor your playstyle, as you prepare to take on one of four terrifying scenarios. 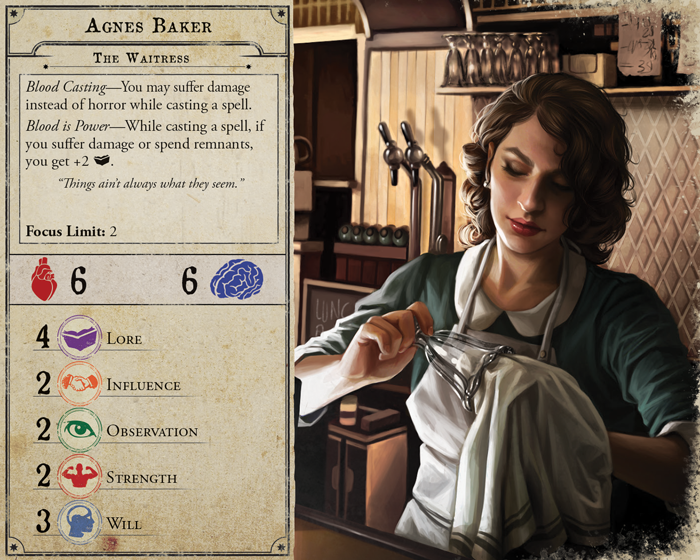 Join us today as we preview four of the twelve investigators found in Arkham Horror Third Edition, the latest version of the classic board game of cooperation and cosmic horror! 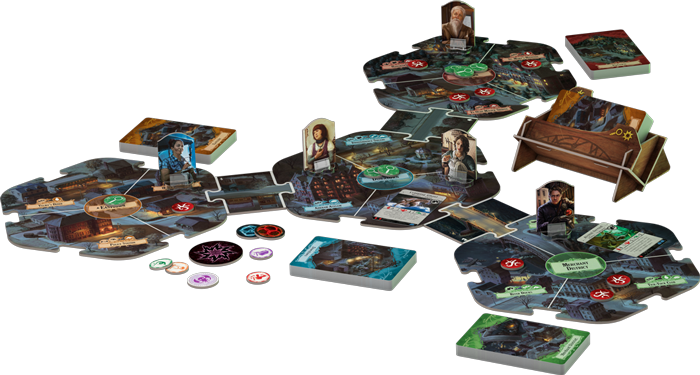 With twelve distinct investigators to choose from, you may feel lost at the start of a game of Arkham Horror Third Edition. 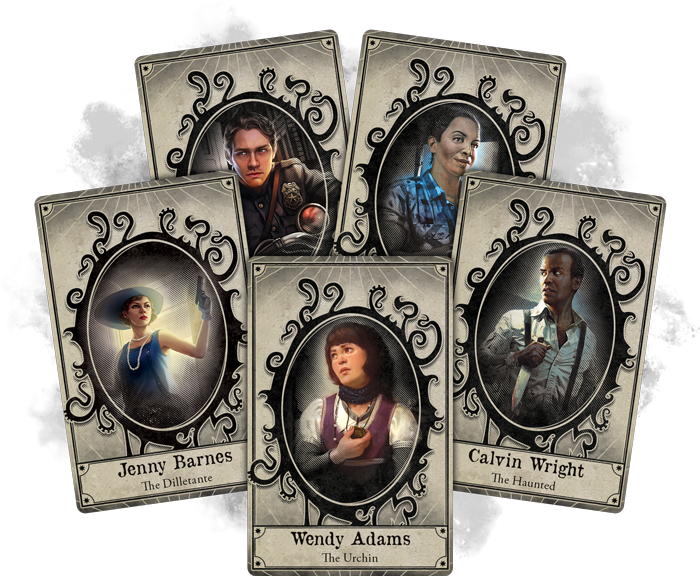 Fortunately, the back of every investigator sheet gives advice on the best way to play that character, describing them as one of five roles that will be instantly familiar to players of Arkham Horror: The Card Game. Seekers are experts at collecting and researching the clues that will lead you to victory. Guardians take on the terrors that lurk in the night with unyielding strength and determination. Mystics practice the arcane arts, utilizing spells to ward doom and defend against the darkness. Rogues specialize in a specific skill that gives them the edge over their opponents. And finally, Survivors get by with wit, skill, and a little bit of luck. While some characters have only one role, most will be a mix of two, providing a variety of different playstyles and approaches. While there are no rules dictating what investigators you must choose to make up your team, it will behoove you to consider these roles when constructing your team. Not only will this help you find a character that matches your playstyle—it can give everyone an investigator that meshes with the rest of the team and gives you greater odds against the overwhelming darkness. Agnes has long been troubled by dreams and visions—robed figures, incantations, keening monsters clawing at the edge of sight. But a while back, she fell and struck her head. Since then, the visions have come in her waking hours. She sees herself, leading the chanting of the robed figures, hiding a silver key in the masonry of a well, conjuring spells as a sorceress in the mythic land of Hyperborea. Seeking an explanation, Agnes came to Arkham, home of storied witch trials and other strange events. She took a job at Velma’s, and one day, she found an old well with loose masonry. Inside, she found an old silver key, exactly where she knew it would be. While the mystic arts can be a tool of Ancient Ones threatening to invade our reality, they can also be an uneasy ally. Agnes Baker practices these arts, and is becoming all too accustomed to their heavy cost. 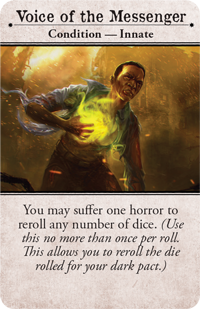 Playing with arcane forces has its consequences, and every spell in Arkham Horror Third Edition will impact your sanity. 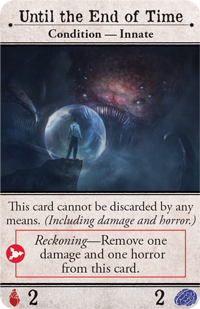 As your investigator explores reality-bending magic they suffer horror as indicated at the bottom of the spell card. However, if you have remnant tokens collected by defeated enemies, you can discard these to power your spell and prevent the horror you might otherwise suffer. Agnes relies heavily on both of these mechanics: she may take damage, rather than horror, to pay for spells, and she receives a boost of two lore when she spends a remnant or takes damage while casting a spell. Agnes’ starting kit also pushes you quickly toward pursuing a path in the mystic arts. 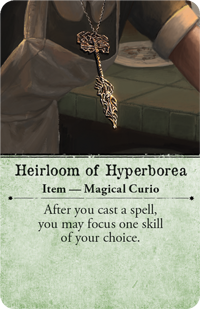 Heirloom of Hyperborea allows you to focus a skill after performing a spell. Though Agnes has a focus limit of two, she is sure to keep that number maxed out due to a bevy of potent spells. Though it’s safe to say your focus is on the mystic arts, you have a choice at the beginning of the game about what kind of Mystic you want to become by choosing to start with one of two spells. 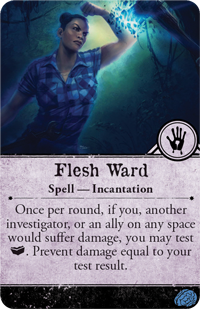 Flesh Ward is a defensive incantation that can protect you or a fellow investigator, letting you test your lore to prevent damage to you or any ally at the cost of one horror, which Agnes can turn into damage to fuel her own spell. Importantly, this spell can stretch across the board to target an investigator in any space, and it serves as helpful protection against the forces of darkness. 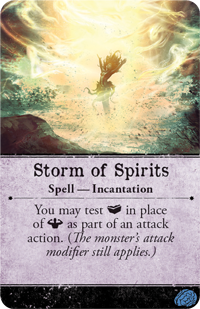 Storm of Spirits, on the other hand, is purely an offensive tactic, letting you test your lore in place of your strength for an attack. By transferring the horror you take into damage or spending a remnant, Agnes's lore is boosted to six, making Storm of Spirits an absolutely massive attack against any foe. As a mixture of the Mystic and Guardian roles, Agnes can balance warding doom with defeating and defending against enemies with potent spells. The hardest thing Calvin has ever done was to walk away from João. But he had no choice. The vision drove him—João burning to dust, the world blasted by light, the darkness within himself. Calvin couldn’t let it take his beloved from him, so he removed himself from the equation. He struck a bargain. He let the cult of the Masked God think that they could control him and waited for the moment to strike back against the ancient evil that threatened the world. It wasn’t that Calvin wasn’t afraid—he was—but he knew what had to be done, and that he was the one man who could do it. 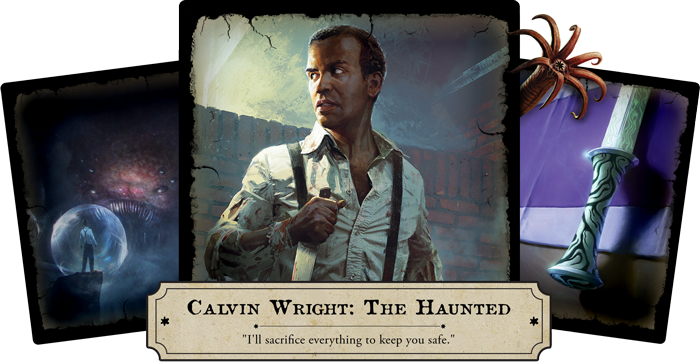 Calvin Wright is a true friend to the other investigators of Arkham—as an action, Calvin may exchange any number of health and/or sanity with another investigator or ally in any space! While this can free up investigators to continue their fight against the darkness, another investigator must always take on their burden. 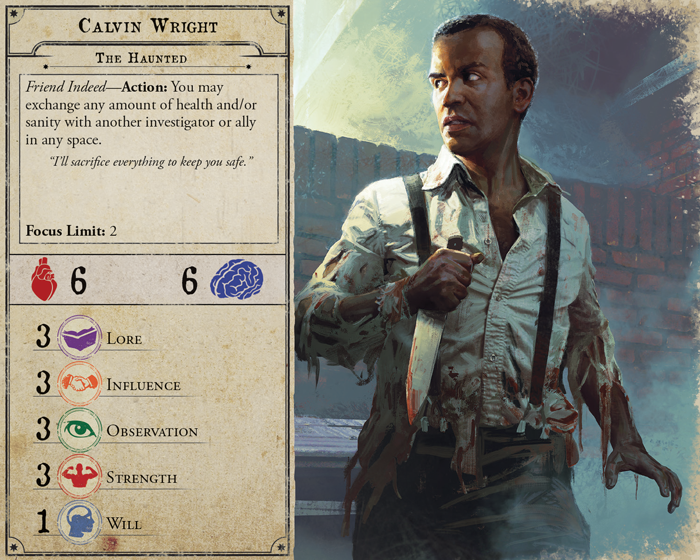 With proper play, Calvin can ensure that the weak are protected while damage and horror are placed on investigators able to carry their weight. While Calvin’s stats are marginal at best, the Spirit Dagger he starts with gives him a significant boost during an attack or ward action. He also begins the game with Until the End of Time, which Calvin can use to mitigate damage meant for him. Assets and allies that have a health and sanity value, such as Until the End of Time, can be used as a target for incoming damage and horror, and are normally discarded when one of their limits is reached. The exception is Until the End of Time. While you cannot place damage or horror beyond its max, a reckoning will free up space on the card, allowing Calvin a future reprieve! 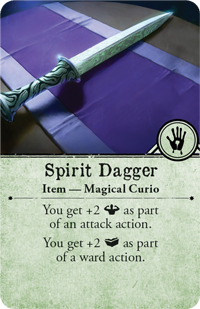 If you’re willing to push your luck, to be truly cursed, you can choose to begin the game with both Voice of the Messenger and a Dark Pact condition. Voice of the Messenger is a powerful condition that lets you reroll any number of dice on a test in exchange for a single horror! But this power comes with a heavy cost. A Dark Pact condition doesn’t do much… at first. During each reckoning, you'll simply roll a die. Should you roll a one, your debt has come due and you must flip your Dark Pact over. 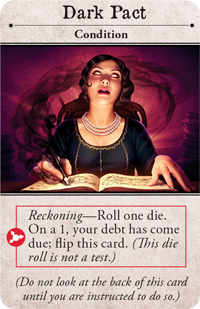 Arkham Horror Third Edition comes with multiple Dark Pact cards, and each one has a different effect. You'll never know what your debt entails but rest assured: the consequences can be dire. Still, you may play an entire game and your Dark Pact may never come due! Are you willing to play the odds? 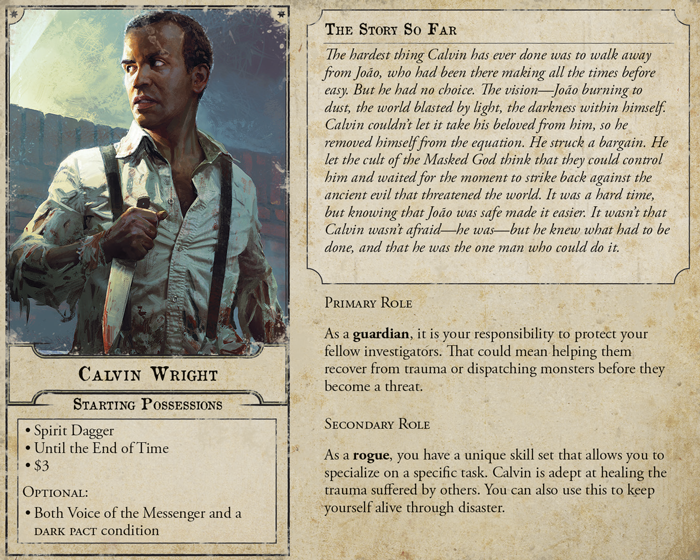 As a mix of Guardian and Rogue roles, Calvin will have to monitor the health and sanity of every character on the board and protect those who need it most. Minh was born to a Vietnamese family in Korea before relocating to the United States. Minh’s facility with languages and her excellent marks helped her secure a job with a firm in Arkham, and Minh was delighted to find that her new boss Mr. Thomas was a good man and a friend. But then Thomas acquired the blasphemous play, the “King in Yellow," and reading it was enough to make him moody and dangerous. He urged her to read it as well, but she found it too disturbing. Before too long, Mr. Thomas killed himself. 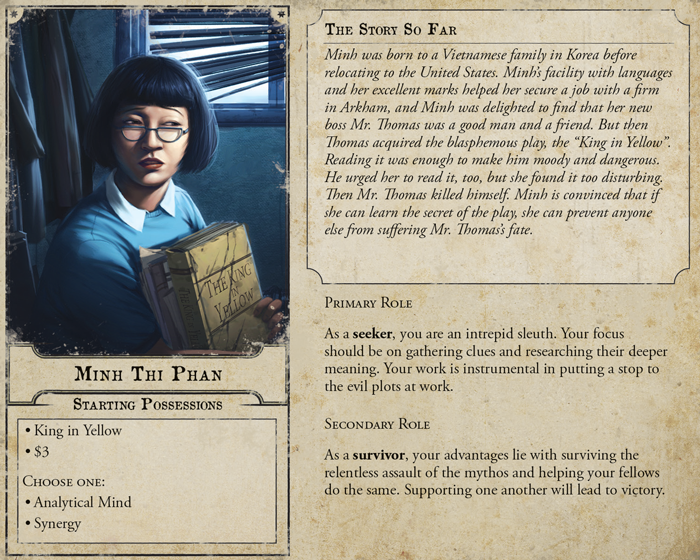 Minh is convinced that if she can learn the secret of the play, she can prevent anyone else from suffering Mr. Thomas’s fate. 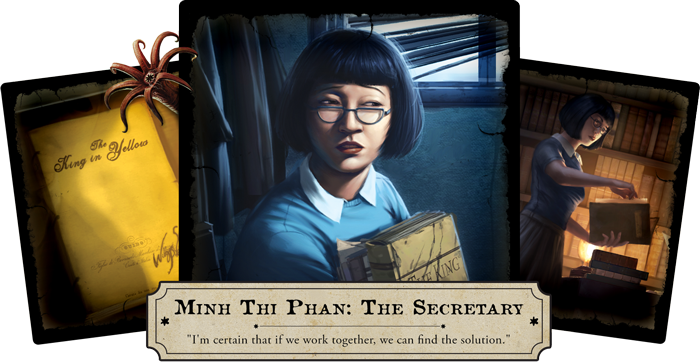 Having Minh Thi Phan on your team is one of your best bets for finding the clues that can lead to a victory against the forces of darkness. With Minh searching for clues, you or an investigator in your space may reroll dice during a test, up to the number of clues in your neighborhood. Obviously, Minh always wants to be at a location with clues, and always working on the research that could very well save the world. 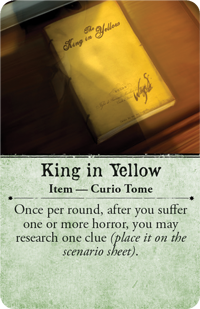 Minh begins the game in possession of the King in Yellow, which allows you to expedite your investigation by researching a clue when you take a horror! 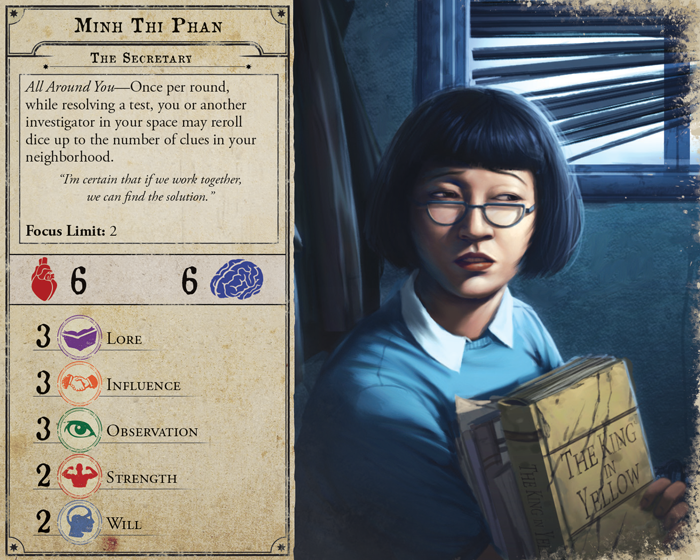 While this can prove to be an efficient way to gain clues, it also encourages Minh Thi Phan to plumb the darkest reaches of Arkham, the parts of the city that would loosen anyone's grip on their sanity. Is it truly worth the risk? Minh also gets a choice between two talents. 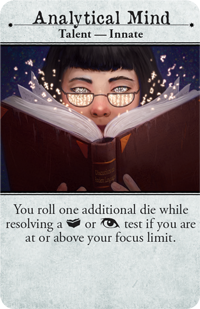 Analytical Mind gives you an additional die during lore or observation tests while you are at or above your focus limit. On the other hand, Synergy increases your focus limit while sharing the benefits of your focus with every investigator in your space! If you plan on going it alone, Analytical Mind can provide all the support you need, while Synergy will be beneficial to a player who wants to stick with the group. Whatever you choose, as a mixture of Seeker and Survivor, you’ll have to research clues while using focus tokens to survive the onslaught of deadly enemies lurking in Arkham. When she looked over her life, Daniela had to admit that it hadn’t been bad—a boisterous family she loved, plenty of work to do, and enough money to indulge her love of motorcycles and pretty girls, even after putting food on the table. Not that she didn’t have her share of aggravations. Her Santería-practicing mother, for one, always warning Daniela to be careful, that a darkness lay ahead of her if she did not beware. Her brother Ramon for another, always getting himself in trouble. Now Ramon is in trouble again, her ward against evil is shattered, and it’s up to Daniela to fix everything. Just like always. 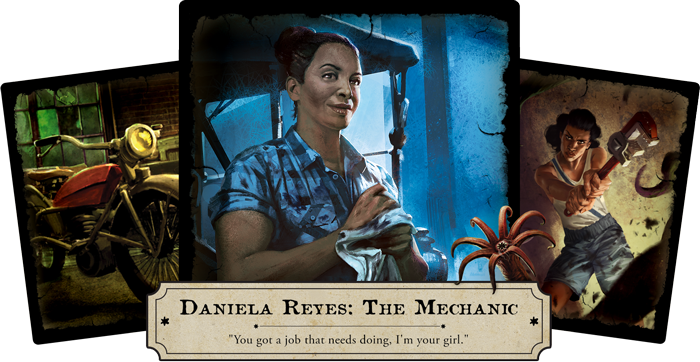 As a Mechanic, Daniela Reyes is a master of efficiency. After you gather resources, you may also focus one of your skills! 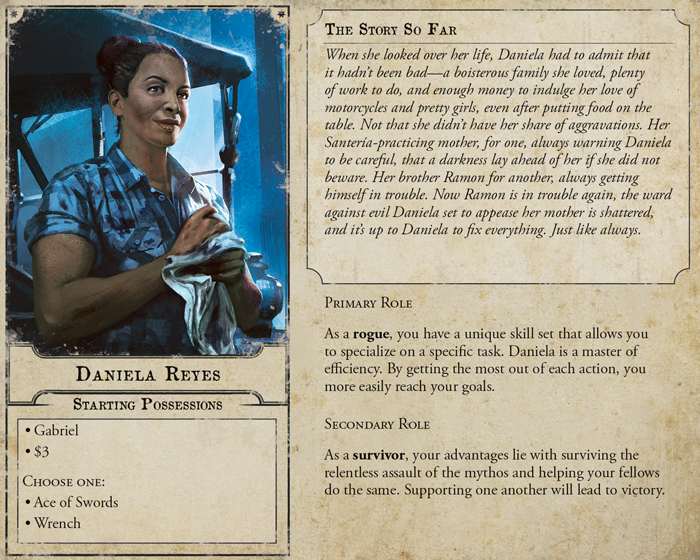 Since you only receive two actions a turn, this added level of efficiency is a great value, and with a focus limit of three, Daniela can very quickly become a powerhouse with plenty of resources to spare. 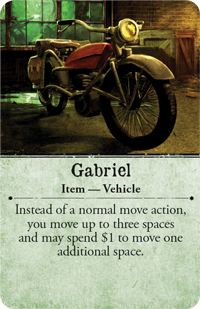 Beginning the game with her motorcycle, Gabriel, Daniela even gets to move an extra space when taking a move action, making her mobile, resourceful, and versatile. 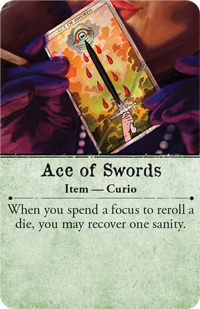 If you intend to use these focus tokens, you may choose to begin the game with Ace of Swords, an item that allows you to recover one sanity whenever you use a focus token to reroll a die. 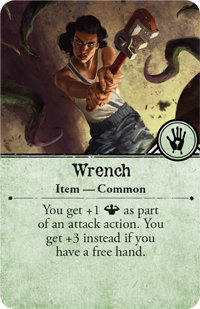 Or, if you prefer to play as a less subtle Daniela Reyes, you can choose to begin the game with a Wrench, which increases your strength during an attack—especially if you can swing it with both hands. While you won’t be recovering sanity, you will be defeating enemies before they get a chance to attack in the first place! 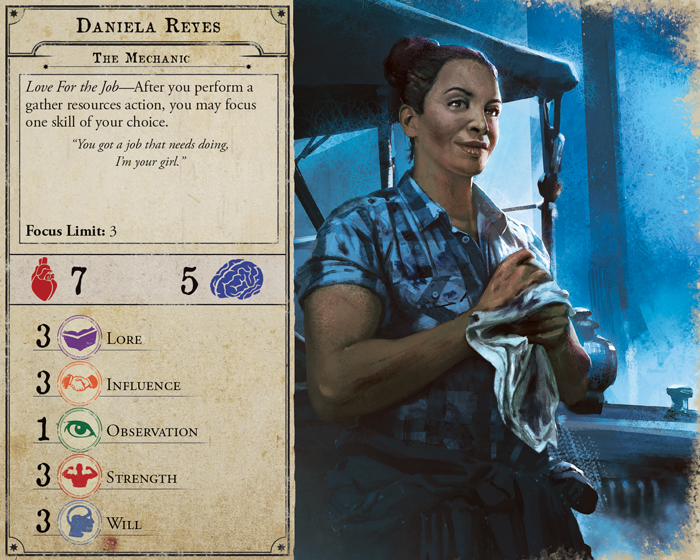 As a Rogue and a Survivor, you’ll have to take advantage of Daniela’s efficiency to perform tasks that other investigators simply can’t. These are just a few of the choices available to you in Arkham Horror Third Edition. 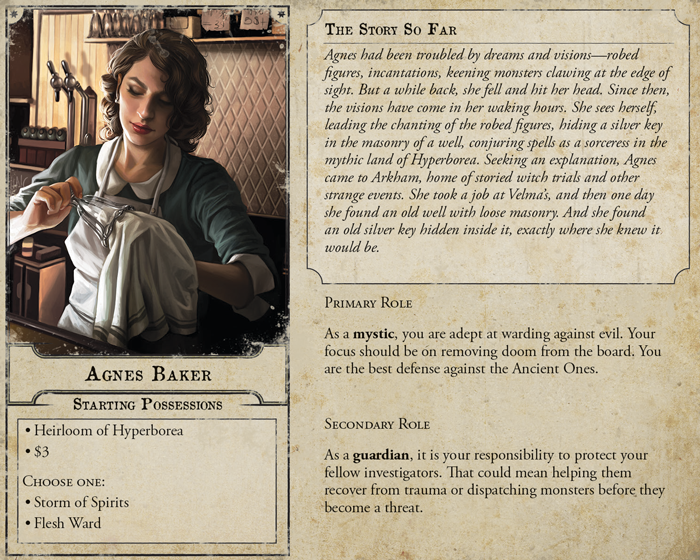 Eight more investigators are also featured in the game, and each provides their own way to investigate this strange city. 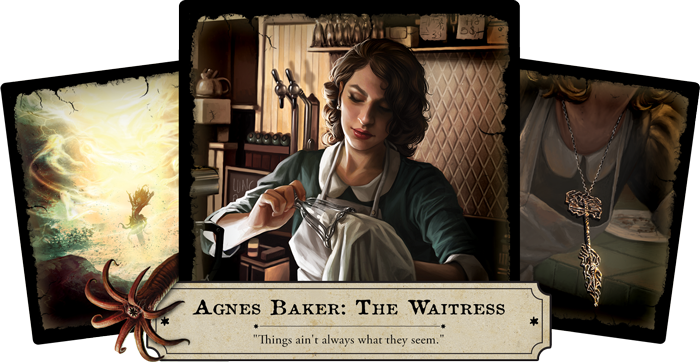 If you are interested in more information about these characters, be sure to check out The Investigators of Arkham Horror, available now from your local retailer or our website. Then, join us next week as we take a look at the terrible scenarios these investigators find themselves in, and the Ancient Ones pulling back the veil of reality. 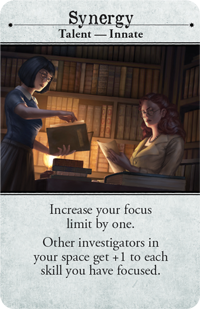 Choose your investigator and pre-order Arkham Horror Third Edition (AHB01), available for pre-order from your local retailer or our website! 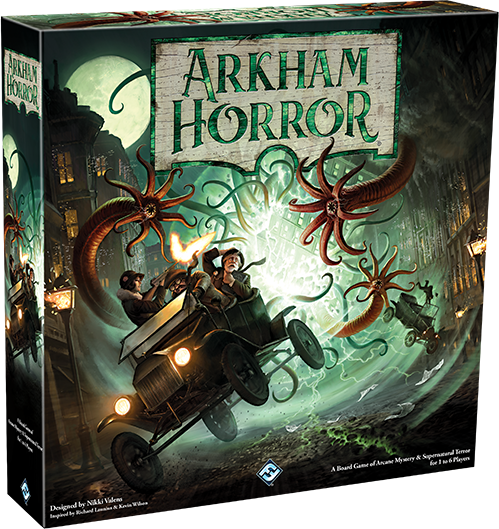 As of 12 p.m. CST on 10/23, the Arkham Horror Third Edition Deluxe Rulebook is officially sold out!